Lacy is grieving for her beloved father with her kind-hearted stepmother when her troubled mother shows up demanding custody. Although clearly the better parent, Lacy's stepmom has no legal claim to her and must give her up to the wild and evil-spirited Cheyenne. Lacy fears that all of the work she has done to overcome her own troubled past will be undone as soon as she is under her mother's influence. She tries to fight it but little by little she loses herself until she must confront her mother and battle for her own soul. On the surface this is a normal story about a girl trying to find her own identity separate from her mother's. But underneath the surface, there is an element of magic. Cheyenne has always turned to dark magic and included her very young daughter in her spells. Now that Lacy is older and trying to resist her mother, Cheyenne goes so far as using magic against her. Lacy's battle for her soul is a very real one and not just a metaphor. 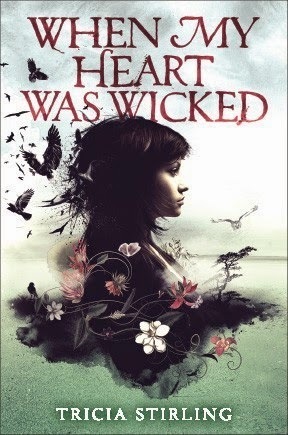 When My Heart Was Wicked is not a traditional fantasy story, nor is it traditional realistic fiction. Fans of Francesca Lia Block's magical realism will enjoy this quick and powerful debut from Tricia Stirling.